Now that I know what you are looking for, I just might set the telescope to track you and send you some green laser Morse Code messages! .. / .- — / .– .- …- .. -. –. .-.-.- / -.-. .- -. / -.– — ..- / … . . / — . ..–..
Hello Space, Thanks for very interesting information! A Lens combination you might want to try/consider is one of those old Tamron 500mm Mirror lenses with its 2X Convertor. I use mine on my Canon 7D @ 1/1600 you can freeze a baseball at home plate from 450′ and you can see the stitching. It makes for a pretty small light package with an effective 1600mm Lens. Wow… and I thought I had problems setting up my camera from earth! 17,300 miles per hour?!! Maybe aperture priority and a couple of hundred flyby’s practice is in order – man you are so privileged, what I wouldn’t give to swap places. In the article, you describe how difficult it is to actually find your target, but you don’t explain how you avoid blur. The picture in the article was taken at 1/3s exposure time (according to the exifs) and seems rather sharp, but I think that might be due to the wide lens. But what if you take such a picture with a 400mm lens? A movement of approx. 2.6km would cause significant blur in such a picture, wouldn’t it? Or do you use some kind of tracking mechanism that moves the camera along to compensate the earth movement? I truly can imagine taking a ‘perfect’ photo is very difficult, especially at a speed of 17.300 miles per hour (28.000 km per hour). But always remember: a picture is not taken by a camera, but by the photographer. He/she pusses the buttons…. A few years back I was lucky to take a 30sec picture of a passing ISS and a chasing orbiter (Discovery if my memory serves me right) at an evening in Emmen (N-E of The Netherlands). Please take lots of pictures for us to enjoy! Don, have you seen any Sprites yet? With all due respect to Dr. Pettit, I highly doubt he’d make a very good sports photographer. Sounds like he should have had a few lessons on camera technique, albeit space may be just a little different. And why such a fairly long exposure? My grand daughters’ inexpensive digital camera goes down to 1/2000th. I would think NASA would have better equipment. If he’s using a ‘hand-held’ his shaking is far worse than the earths motion. All issues like this can be fixed by using MORE POWER. Nicely done. Great article for perspective. The photos from the ISS have been amazing. I see you, however, I will like to see & understand Y O U? Would never really have thought of these problems but they seem obvious when you point them out. Such is life I guess. Thanks for sharing and should I ever make it up to a space station or a shuttle I will bear your tips in mind! ok really gud information but question iz itz only limited to photography? or really itz appearence also harder than previous or older information about d crust of our earth??? I’m so glad to have seen this post. I am a photographer myself, and I have over the years often wondered why there aren’t more good photos of Earth taken from orbit. Now I understand some of the difficulties I hadn’t given much thought to. What are the man made structures that can be seen from the station? That is so cool but what is that green shinny that the side of earth though.? Thank you for your information in your ongoing blog regarding Space Station activity and your life in space. It is very important that we, the United States of America, continue exploring and looking for answers for the many questions we all have and the questions yet to come. so when is the next time that the space station will pass over silverton Or. at the right time for me to see it in the night sky? I live in silverton and am a big fan of Don Pettet and it would be so cool to see the space station wise by up in space form down hear on earth. Hello there; best wishes, from Puerto Rico. Keep up with the good job of you all! Hopefuly you can send me a pic. of my island at either dusk or dawn. No! You should be too busy up there, never mind, best regards! Thanks Don, for 30 seconds as I read your blog I’m up there with you. OK, thank you – that is somehow what I was assuming. Why aren’t there more photographs like that very interesting one above? A bit of epxplanation would be fine, too! I appreciate your efforts, thanks again and happy shootings. Interesting post. Is the manual tracking of a target done entirely by hand? That is, without the aid of somekind of stable platform like a panning tripod head? Also, is manual tracking necesssary because the mass of the camera and telephoto lens is too large for an auto tracker of reasonable size and mass, or just too expensive? I don’t know what camera or lens you are using, but I’ve read you have a Nikon D3s up there, and you may have a Nikkor 400mm f/2.8 lens? Assuming that is so, try dialing up the ISO to 3200, 6400 and even 12800. Then go into the menu and turn OFF the High ISO NR (you’ll get more noise but greater detail in your photos), and decrease the exposure compensation to -1. Another suggestion – if you are shooting in the P (Program) mode, twirl the back command dial until the aperture is 5.6 (assuming an f/2.8 lens, that’s only two stops above maximum aperture) which should also gain some shutter speed for the same exposure. The D3s has a maximum shutter speed of 1/8000th of a second, so get as close to that as you can which should reduce the motion distance to one meter instead of eight meters. Trial and error might reveal what works. i love the pictures. ive always been amazed at the pkanet we live on . im worried easily of our earths safety for our children and generations to come and also hope that our earth will be around for some time to come. Hope that the 2012 prediction is not something for us to worry about . But i do know we need to all come together and start protecting nature and using our resources respectfully! Amazing! 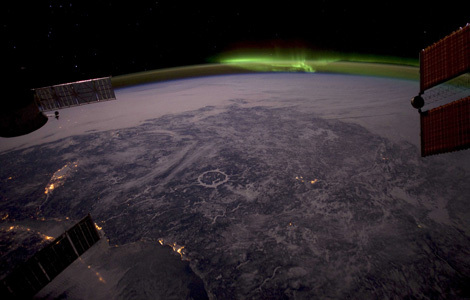 The ring in the middle of the picture is the famous Manicouagan Reservoir, an impact crater with 200 million years old! Great! Keep taking great pictures of Earth! I have a question, though. When I watch the live video feeds from the ISS of the Earth, the Earth is always placed in the upper quadrants of the pictures, as though it is overhead. You mentioned that you see it spinning below your feet – and that is how I would like to see it also. But from the video feeds, it is almost always overhead, and that is disconcerting, and disorienting. When I try to figure out where a place is and compare it to a globe, I have to mentally reverse and invert it to get it be comparable. Is there a reason that the video feeds to the Earth are always that way? I asked somebody at the imagery place at JSC and they said that is just the way the astronauts park the cameras. Congratulations for those great pics. Any chance you have a prism up there with you? I’d be curious to see how a sunrise/sunset looks like in the spectral domain, as the Sun rays traverse different layers of the atmosphere.. I don’t know if that setup would work with Auroras, come to think of it..
Great post. I never realized the complexity of photographing the earth. It’s amazing what we do with photography these days compared to 20 yrs ago.